Robin Lopez was back on the bench inactive Friday for the Bulls game with the Orlando Magic, $25,000 poorer because of his theatrics with the officials Thursday in Miami and even more the team guy. "Teammates sacrifice for each other," Lopez said before Friday's game about his return to inactivity. "That's how I am viewing this." It's also the way Lopez viewed his outburst and ensuing spectacle Thursday that resulted win the $25,000 fine from the NBA for "not leaving the court in a timely manner following his ejection." "I anticipated something," Lopez said. "I think 25 is a lot of something, but I anticipated something." 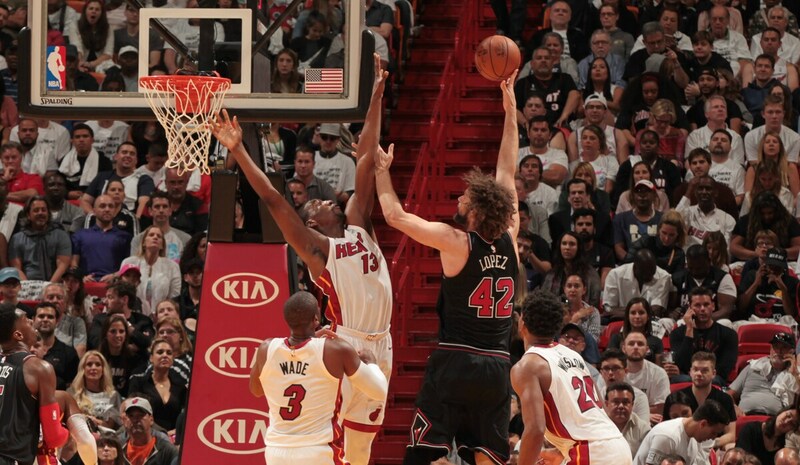 But Lopez also understood, perhaps innately in some respects, the Bulls needed to begin fighting back after a series of bad losses and that the officials, perhaps anticipating some lack of interest on the part of the Bulls, appeared to be allowing Miami to get away with a bit more physical play. It's a natural tendency that works against a team that is losing. The belief becomes, even the officials remain as neutral as possible, that the aggressor achieves. And thus deserves the benefit of the doubt. "He lays it on the line every second he's on the floor. We do need emotion, and Robin is a guy that's going to bring it every time he plays." Lopez was having none of it. And after coach Fred Hoiberg was assessed a technical foul earlier for an objection, Lopez had seen and heard enough after back to back offensive foul calls. Especially after David Nwaba earlier had been hacked by four Miami players without a tweet. "When I am out there, I try to be a backbone for the team, obviously," said Lopez. "I think we have a lot of guys like that. When KDs (Kris Dunn) out there, he's an emotional player. He's someone the team rallies around. Zelly (Denzel Valentine), he's a vocal guy, an emotional guy that guys rally around him, for sure. I think we have a lot of guys like that." Though really no one like Lopez, which is one vital reason why the seven footer deserves a place with the team. Even in this post All-Star period where he hasn't been playing, he's been relentlessly supportive and positive, the ultimate team player. And then when he was drafted back to starting Thursday after the hungry Heat with so many big men out, Lopez had everyone's back. That it cost him $25,000 was just part of his job. "Lighter (check) that usual," Lopez shrugged, though hardly with regret, more matter-of-fact. "There were going to be repercussions. This time I had NBA security called me and they wanted to know why I was so tardy leaving the floor. They hear why first, but I don't know how much they take into account. There was somebody from the players association; we had NBA security on the line." Since the Bulls were playing Friday night, action had to be taken. But Lopez didn't want anyone to get the wrong idea that he isn't in control. "Last season we were in many close games, meaningful games," Lopez pointed out. "And I've kept my composure. You're going to have games like that. I think I'm able to find that balance." Lopez said he believes it will be a "game by game situation" regarding his play the last six games. "You have to make the most of it," he said. "We're all still trying to get better, still trying work for each other. Whether I am on the bench or on the court, that's our goal. "I think we mutually admire each other," Lopez asked about being with the Bulls beyond this season with a year left on his deal. "You never know what is going to happen in the league. I do (want to be here). We have a lot of great guys on the team; we have a lot great potential with this team. It's been a rough stretch, but I know it's not all like this. I don't know if it's a punishment so much as a sacrifice." Lopez said someone on the team mentioned to him Joakim Noah's famous outburst in Sacramento when he called out the referees and tried to throw them out of the game. "Jo's definitely was a 10," Lopez acknowledged with a smile. "That's something to aspire to."